Using the dataVoice Outage System in conjunction with your advanced metering infrastructure system, personnel from different departments can tap into a wealth of data to better manage and analyze power problems in your utility network. Check Individual or Downline Meter Status: Back-office personnel can request individual status pings before sending out repair crews. These remote monitoring methods are extremely helpful after hours and often save considerable time and money spent on unnecessary dispatching. Check Meter Voltage: Often, members will call to report unusually dim lighting. With our Outage System, main office staff can perform voltage checks and determine if members are experiencing low voltage. AMI Blink/Sag-Swell Analysis: This analysis tool enables utilities to predict the likely source of a problem based on blinks, sags or swells reported by AMI systems. 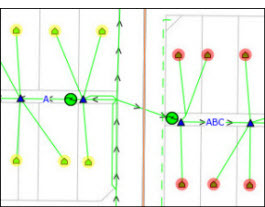 Metering Point Status Indication: Our system automatically notifies the operations department when the connection between your AMI System and substation becomes extremely slow or falls out completely. In these moments, it enables operations personnel to respond quickly and efficiently deal with the problem. The dataVoice Outage System equips users with the tools necessary to quickly and efficiently respond to outages, monitor problematic network equipment and provide effective member service.